Paul’s admonition to the brethren at Philippi is often used in sermons. Most often we hear speakers compare what Paul said to the effort put forth by individuals running in a race. This is certainly not inappropriate. However, many years back I ran across a statement by E. M. Blaiklock that changed my thinking. Blaiklock was a noted classicist. This particular comment comes from Cities of the New Testament. One mark of the Roman colony is perhaps to be detected in the letter which Paul wrote, over ten years later, to the Macedonian church which he had come to love. It is a hidden metaphor from the chariot race. Exhorting his Philippians to effort and single-minded endurance, Paul writes: ‘This one thing I do-forgetting the things behind, and stretching out to those before, I make for the mark, the prize of the upward calling’. Commentators generally have not marked the fact that Paul appears to have in mind, not the athletic contests of the Greeks, from which he commonly drew illustration, but the chariot racing of Rome. He was writing to a Roman colony. He was writing also from Rome itself, and never was there such rivalry of racing colours, and circus fever than at that time. The common talk of the soldiers of the soldiers was of the chariot racing, and Paul would gain a vivid impression of this most perilous of sports. Such a race as that which forms the substance of Paul’s figure is described well in Ben HUR. The charioteer stood on a tiny platform over sturdy wheels and axle. His knees were pressed against the curved rail, and his thighs flexed. He bent forward at the waist, stretching out hands and head over the horses’ backs. This is surely what he means by ‘stretching out to the things before’. The reins were wound round the body, and braced on the reins the body formed a taut spring. It can easily be seen how completely the charioteer was at the mercy of his team’s sure feet and his own fine driving skill. Euripides, in his Hippolytus, tells how the hero fell and was killed in such conditions. Ovid describes the same disaster in Book XV of his Metamorphoses. In his intense preoccupation the driver dare not cast a glance at ‘the things behind’. The roaring crowd, crying praise or blame, the racing of his rivals, all else had perforce to be forgotten. One object only could fill the driver’s eye, the point to which he drove at the end of each lap. Here is a photo that might help to illustrate what Blaiklock said. 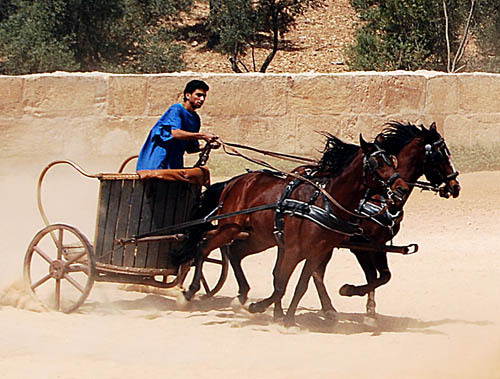 It was made at the RACE show (Romy Army and Chariot Experience) at Jerash, Jordan. … and all I got was this little Dead Sea Scroll jar. (Of course, anyone acquainted with his grandmother knows differently!) After Grandmother read him the Mystery of the Dead Sea Scrolls, he promptly hid his jar in a secret place [behind the easy chair]. 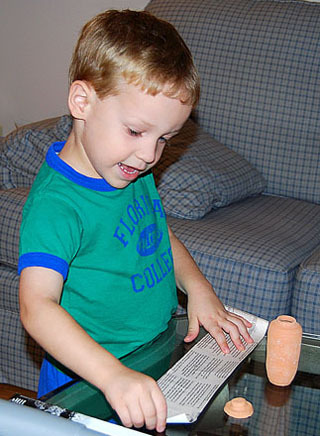 What a wonderful thing to learn about at his age. The Dead Sea Scrolls, discovered in 1947, are of great value to biblical studies. Below is a photograph of Cave 4 at Qumran, on the shores of the Dead Sea. 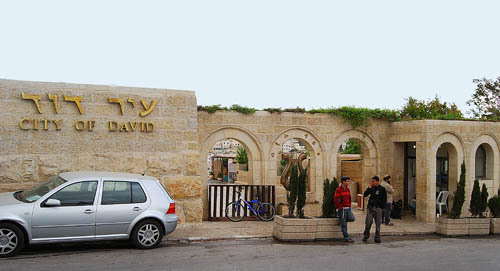 Numerous fragments of the first five books of the Old Testament (Torah) were found in this cave. 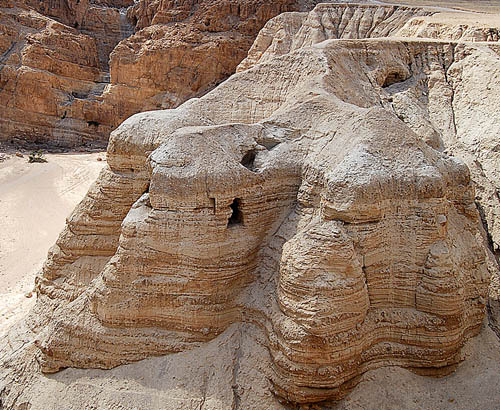 Qumran was in Jordan at the time of the initial discovery of the scrolls. Some of the scrolls are now displayed at the Shrine of the Book in Jerusalem. The site has been excavated since 1966, beginning under the direction of Kenan Erim of New York University. Marble was readily available at a nearby quarry and the excavation has brought to light a multitude of marble inscriptions and statues from the Roman period including a statue of the Emperor Domitian. Buildings include a theater, an agora, a bath, temples, and a well-preserved stadium. Louw-Nida describes a stadium as an “open, oval area (frequently including a racetrack) around which was built an enclosed series of tiers of seats for those who came to watch the spectacles – arena, stadium.” When Paul spoke of running the race in 1 Corinthians 9:24, he used the Greek term stadion. The term was also used as a measure of distance and is found in John 6:19. It was about one-eighth of a Roman mile. Most large Greek and Roman cities had a stadium. The figure of the stadium is in mind in Hebrews 12:1-2, where a host of witnesses watch as we run the race. 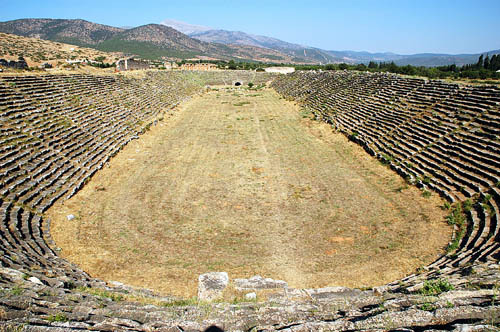 The stadium at Aphrodisias is the best preserved I have seen and I wanted to share it with you in the photo I made in 2006. Picture yourself in the stadium. This article, with minor changes, was published in Biblical Insights, September, 2006. One coin at a time is Brett Telford’s blog about coins. He has a marvelous photo of a silver Tetradrachm showing the image of Domitian. It was struck in Tarsus about A.D. 93-95. Please take a look. The portrait reveals an emperor weary from insecurity and suspicion of conspiracy in the later years of his reign. His gaze bears witness to the demons that incited his paranoia. Domitian’s reign of terror began at around AD 93 and lasted until his death in AD 96… about the same time that this coin was struck. After an interesting discussion of Ethelbert Stauffer’s theory that the titles of Domitian equal 666, Telford comments on the coincidence that this coin was minted at Tarsus, home of the apostle Paul. This coin isn’t without its own Biblical reference. Tarsus, the city in which this coin was minted, was the birthplace of the Apostle Paul. Isn’t it ironic then, that a coin of the purported Biblical “Beast” was struck in the very city that brought us the most notable of early Christian missionaries. Previously I have called attention to my books on Revelation. I failed to mention another brief publication about Domitian. Several years back Arthur M. Ogden and I wrote a series of exchanges. This publication, Did Domitian Persecute Christian? is available free in PDF at BibleWorld. I have seen various inscriptions on which the name of Domitian has been scratched off. It means that he was a person of damnable memory. Recently on our trip to Jerash in Jordan we saw two inscription discovered when the theater was being restored. Here is a photo of one of them. 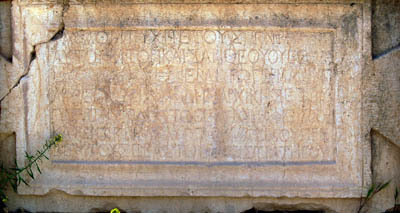 The inscription, which dates to the year A.D. 90/91, bears the title of the Emperor Domitian, but his name has been erased. The emperor is said to be the son of “divine (theou) Vespasian.” At the moment I can’t put my hands on it, but I recall that a translation of both inscriptions is included in the Newsletter of the American Schools of Oriental Research, Oct., 1974. Inscriptions like this definitely need to be in a controlled environment rather than outside in the weather. On our upcoming Steps of Paul and John tour the name of Domitian will be used often. HT: Georg S. Adamsen, Revelation Resources. The Holy Land: An Oxford Archaeological Guide by Jerome Murphy-O’Connor is now back in print. Be sure you get the fifth edition (2008). This is one of the finest, most authoritative guide of archaeological sites in Israel. Something Murphy-O’Connor said in one of the interviews is that he is unable to judge regarding some claims made by various archaeologists. He said, “I write as a communicator.” I like that, and think of myself in the same way as I direct my tours. Another good book to study along with your Bible is the Wycliffe Historical Geography of Bible Lands by Vos. Be sure you get the 2003 edition. The earlier edition was by Pfeiffer and Vos, but has now been updated by Vos. Go to our Travel Book Store to order.